Aster novae-angliae of Michigan Flora. Open, usually moist to wet ground, including shores, meadows, fields, shrubby swamps, fens and wet prairies, edges of streams and rivers, thickets; dryish to moist forests (especially along banks and roadsides); somewhat weedy in habit. The Schoolcraft Co. specimen is said to have escaped from cultivation, and it is possible that some of the other northern records are also escapes, though from more natural habitats. 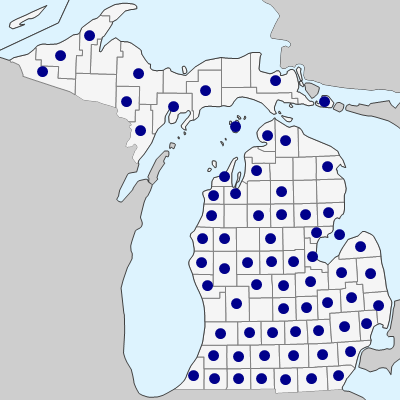 Also clear is that most of the northern records are recent; the species having evidently spread northwards recently from an original range that may have been largely the southern half of the Lower Peninsula. 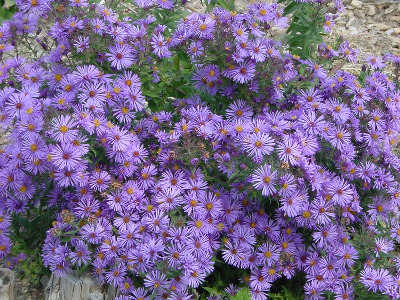 Like many other asters, the ray color varies from blue to purple, occasionally rose. White-rayed plants, however, appear to be very rare. Where this species grows with S. ericoides, an attractive hybrid, S. ×amethystinum (Nutt.) G. L. Nesom, may occur. It is quite intermediate between these very different parents, with the leaves resembling miniature ones of S. novae-angliae but the copiously flowering inflorescence with smaller heads resembling that of S. ericoides, but with light blue rays. The phyllaries mostly lack the tiny spinose tips of the latter, although the leaves may have such tips. This hybrid has been collected in Macomb, Monroe, Oakland, Washtenaw, and Wayne Cos.
MICHIGAN FLORA ONLINE. A. A. Reznicek, E. G. Voss, & B. S. Walters. February 2011. University of Michigan. Web. April 21, 2019. https://michiganflora.net/species.aspx?id=487.